Conservatives have balked at their own party's plan, saying it is still too costly for the government. 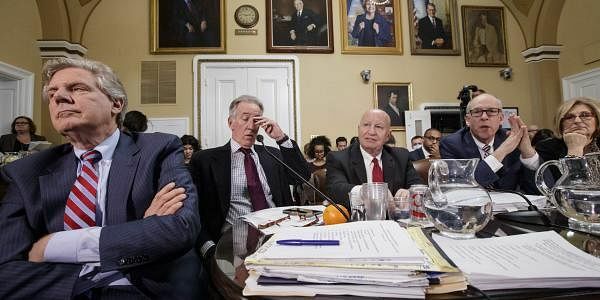 WASHINGTON: US President Donald Trump held last-minute negotiations with fellow Republicans to avoid a humiliating defeat Thursday in his biggest legislative test to date, as lawmakers vote on an Obamacare replacement plan which conservatives threaten to sink. Seven years to the day since Barack Obama signed his landmark health care reforms into law, House Republican leaders were facing the grim prospect of insufficient support within their own ranks. Republicans have spent years railing against the Affordable Care Act, branding it an example of Democrats pushing for socialized medicine. But Trump faces a reckoning as several dozen conservatives in his party have vowed to oppose the new legislation unless important last-minute changes are made. They have said they want to repeal health benefits that are considered essential and that all insurance policies must pay for under Obamacare -- including maternity care, emergency room visits, and preventive care like screenings and vaccines -- arguing they have driven up costs. But others, mainly moderates in the party, worry their constituents will no longer be able to afford health insurance under the Republican plan. A nonpartisan congressional budget estimate says it would lead 14 million Americans to lose their coverage from next year. With Democrats opposed to Trump's effort to rip out his predecessor's crowning domestic policy achievement, and his own party's right flank in revolt, the White House and Republican leaders have been burning midnight oil to find ways to tweak the bill to make it palatable to enough conservatives without angering moderates. The Democratic minority is prepared to vote against it as a bloc, so Republican leaders need to limit defections to just 22 out of their party's 237 representatives among the House's 430 current members. As of midday Thursday, 36 Republicans, mostly conservatives, had announced their opposition, according to a Washington Post count. Trump was to huddle in the White House before the vote with a number of conservatives in a bid to get them on board and prevent an embarrassing collapse. Further upping the pressure on recalcitrant Republicans, Trump tweeted a message to his 27 million followers on Thursday urging them to contact their local lawmakers in support of the repeal and replace plan. But congressman Thomas Massie said the arm-twisting would not work on him. "I'm still opposed to the bill," the Kentucky Republican told MSNBC. "I think it's worse than Obamacare." Senator Mike Lee, also a firm conservative, said the legislation lacked sufficient support in either chamber of Congress. "This bill is going to fail," Lee told Fox News. A key element of Republican opposition is the House Freedom Caucus, a collection of about 30 lawmakers who are heirs apparent to the ultra-conservative Tea Party movement and are known to buck party leadership. They dub the new bill "Obamacare Light," as it will only reduce, not eliminate, health coverage subsidies by replacing them with refundable tax credits. Corralling them into Trump's and House Speaker Paul Ryan's camp will be critical. The Caucus chairman Mark Meadows has demanded key changes to the legislation before the House vote, warning Wednesday there were "not enough votes to pass it." But he also stressed that the president was "engaged" in the process. Party leaders made tweaks to the bill late Monday, including elements aimed at reducing costs for seniors and the poor, which they hope will allay concerns enough for the bill to squeak by in Thursday's vote. In a Wall Street Journal opinion column, Ryan called it a bold and "radically different" health care reform to Obama's. "Instead of imposing arrogant and paternalistic mandates, it would increase choice and competition, creating a vibrant market where every American will have access to quality, affordable coverage," Ryan wrote. Trump has put his own credibility and deal-making skills on the line for the measure, but he has also suggested he could single out lawmakers and make their lives difficult if they defy him. Obama himself weighed in on the big debate of the day in Washington, saying the law which has helped 20 million people get coverage should be improved, not pulled out by its roots. "We should start from the baseline that any changes will make our health care system better, not worse for hardworking Americans. That should always be our priority," Obama said in a statement.